The monetary history of Ukraine extends back to ancient times. In fact, it was first colonized by the Greeks. From 7th century BC, the Greeks began to colonize the coast of the Black Sea. They traded wine, oil, and textiles, silver and gold wares and clay utensils with local tribes for grain and hides. However, the Greeks also engaged in slave trade with the locals. 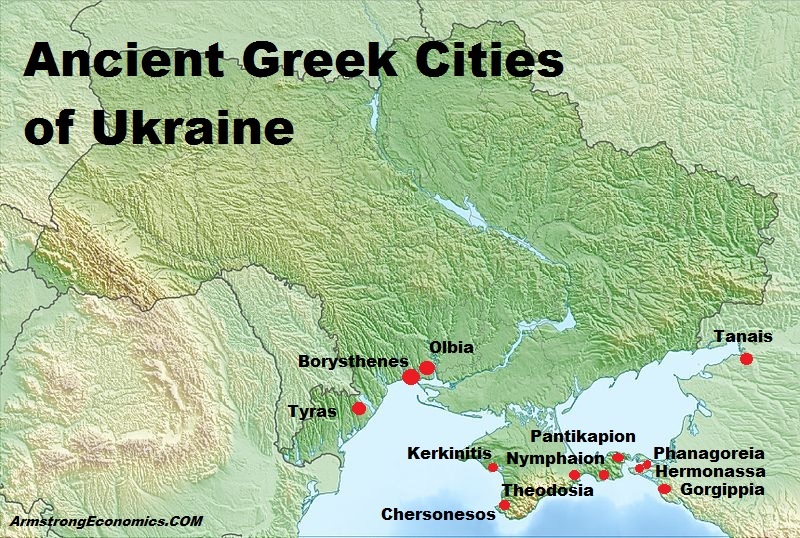 Nonetheless, the Greeks introduced their culture to the region bringing civilization to Ukraine. Many local tribes began to adopt Greek customs and religion, as well as their language. The Greek historian Herodotus (c. 484-425 BC) documented information about Ukraine during this early period. Some of the tribes of Ukraine tended to be nomadic and were moving also in the region of Romania. Others were agricultural and fixed to a location. There appears to be frequent warfare between many tribes that was driven simply by taking the property of others. The actual oldest known main inhabitants of Ukraine were Cimmerians, from which we derive the name Crimea in the Southern region of Ukraine on the Black Sea.. They were replaced during 5th century BC by Scythians, who appear to have ruled this region until the 2nd century BC. 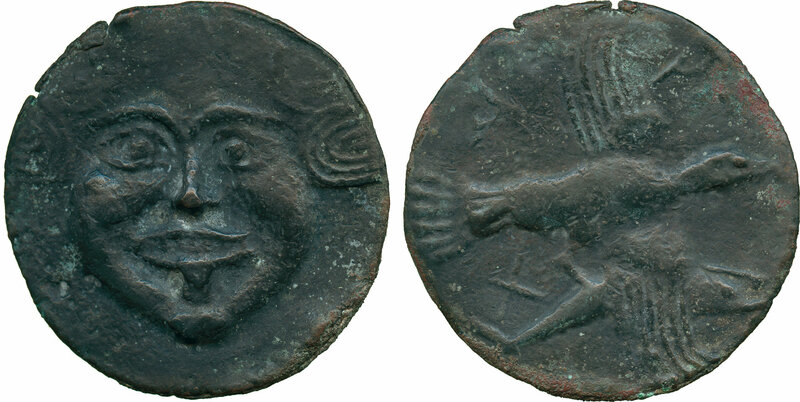 They are famous for producing bronze coinage with the facing Gorgon and coins in the shape of a dolphin. Their region became known as Olbia. 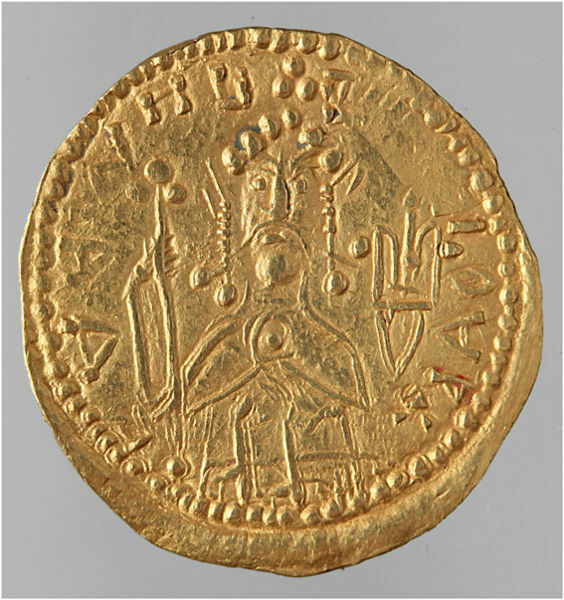 The origin of the Scythians, who produced some remarkable coins, was shrouded in mystery. Herodotus suggested they might have arrived from the northern steppes to displace the Cimmerians, but he also records that they may have been descended from Zeus and the daughter of the Borysthenes river, or originated from the union of Heracles and a half-woman, half-snake who lived in the woodlands. Crimea. The region became an important source of grain, gold and other trade goods, and was an active marketplace for art objects of Greek manufacture, which often are found there. 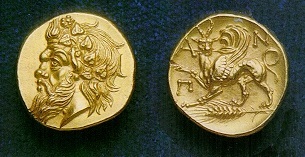 The artistry on Scythian coins is distinctive because it combines the traditions of nomadic, Greek and Near-Eastern cultures. It is imbued with a vitality and fierceness quite unlike Classical and early Hellenistic Greek art, which had abandoned Archaic vigour in favour of idealized beauty. The griffin appears on other forms of Scythian art, which often are found in royal tombs. The region was then conquered during the 2nd century AD by the fierce German tribe known as the Goths from Baltic region who also tormented the Romans. About 370 AD, the first Asian horde of Huns invaded on their way to western Europe. The Huns defeated the Goths as they fled Ukraine running back to Germany and the Huns followed. The Huns were followed about 300 years later during the 5th-6th centuries by the Bulgars and Avars as Europe pushed back into the region. Ukraine has been exchanging hands on a 300 years cycle since Ancient times. The precise origin of Slavic people is not exactly known. We generally assume (guess) that they existed for centuries before they were mentioned in any of the historical accounts recorded by Romans as early as the 1st century AD. Perhaps the most dominant Slavic tribe was known as the Wends that appear during the 4th century AD. They began to settle in central Ukraine moving upward to Baltic Sea. It was not until the 6th century AD when this tribe began to move into Southwest Germany, becoming the dominant tribe in Ukraine and were ruled by princes, yet appear to have a political representative body or people’s councils composed of tribal elders. They appear to have been militarily active on all their borders. Kyiv was founded in the 5th century by three brothers Kiy, Shchek and Khoriv and their sister Lebid based upon legend. Kyiv was reigned by princes (or chieftains) Askold and Dyr. This is the real origin of Ukrainian civilization of the modern era. By the end of the 7th century AD, we find the Khazars establishing themselves on Caspian steppes. This actually protected Ukraine from other Asian hordes who had to confront this fierce tribe. At this same period in time during the 7th century AD, the Greeks left Black Sea shore region and this creates a dark age as recorded history in the region stops. The Khazar control of the steppe was breached in the late 9th century by the Magyars, who later were replaced by Pechenegs and then by Polovetsians as dominant tribes.It was not until about 879AD when we begin to see Kyiv truly begin to rise as a strong political center that would last until the Mongol Invasions. Prince Olekh is reported to have begun to establish the Kyivan State proper in 879. He conducted various military expeditions and confronted the Byzantine empire. He was followed by Prince Ehor in 912AD, who was also militarily active and also was confronted by civil war regarding the uprising of the tribes of Ulitchs and Derevlans. Ehor died during a battle with Derevlans in 945AD. His death was revenged by his wife Olha who retaliated and brutal oppressed the Derevlans. In 964AD she was converted to Christianity and placed her son Svyatoslav on the throne who she raised to be wise and courageous. 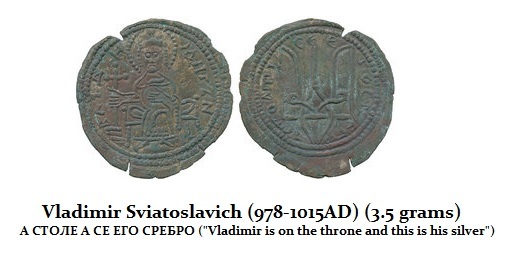 It was Svyatoslav was of the Rurik dynasty. He fought against the invading Asian hordes coming in from the East. He also waged war against the Bulgarians. Like Charlemagne, Svyatoslav divided the Kyiv state between his sons. Upon his death in 972AD during battle with Pechenegs, his sons naturally fought among themselves for power. Svyatoslav’s son Prince Volodymyr (Vladimir) was the prince of Novgorod. He was forced to flee to Scandinavia in 976AD after his brother Yaropolk had murdered his other brother Oleg and conquered Rus’. In Sweden, with the help from his relative Ladejarl Håkon Sigurdsson, who was the ruler of Norway at the time, Volodymyr assembled a Varangian army and reconquered Novgorod from Yaropolk. By 980AD, Volodymyr had consolidated the Kyivan realm from modern-day Ukraine to the Baltic Sea and had solidified the frontiers against incursions of Bulgarian, Baltic, and Eastern nomads. Finally, in 980AD, Prince Volodymyr managed to defeat all his brothers and unified the country into one powerful state with Kyiv as the capital. Volodymyr adopted Christianity in 988AD and began a campaign to convert the entire population Christianizing the Kievan Rus’. Volodymyr produced silver and gold coins with his portrait on one side and the trident on the reverse side (The trident is Coat of Arms of present day Ukraine). His coins blodly declare that he is on the throne and this is his silver. His gold coins are exceptionally rare but are the first portraits to appear in this region. Therefore, it is clear that this is the first ruler who is establishing his mark upon the region. In History he is known as Volodymyr the Great or Saint Volodymyr. During his reign, hordes from Pecheneg defeated the Khazars and pushed out the Hungarian hordes from the southern steppes. Now they began to encroah upon the Kyivian state. Volodymyr began to fortify Kyiv against these invaders. After his death in 1015AD, fighting and assassinations emerged among his sons, resulting in victory for Prince Yaroslav in 1019AD. Yaroslav I the Great or the Wise then consolidated nearly the entire region of his father’s territory defeating the Pechenegs. Yaroslav became one of the most powerful rulers in Europe at this time. We begin to see now the Eastern Church hierarchy start to emerge with the head established about 1037AD in Kyiv. 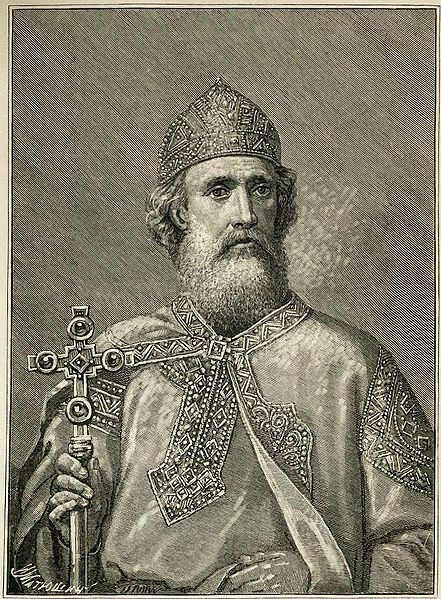 The patriarch of Constantinople.Yaroslav promoted family ties with other kingdoms through intermarriage and embarked on a major building project that improved Kyiv’s fortifications and added churches. He also introduced the rule of law and established legal courts. Yaroslav made the same mistake and divided the country between his sons, who after his death in 1054, started to fight among themselves and divide their land between their sons. This resulted in a number of small principalities weakening Kyiv which not only fought each other, but also had to defend themselves from invaders coming from the north, east, and south. Finally, in 1097AD, all the princes agreed to stop fighting between themselves. Then in 1103AD, they united their forces under leadership of Prince Monomakh (one of the grandsons of Yaroslav the Great) to face the Polovetsian hordes, who they defeated. The division among the princes weakened the country and brought about the near collapse of both the cultural and political systems within Ukraine. Ukraine remained fragmented into the numerous principalities, each having their own customs and rules, with only nominal allegiance to the Prince of Kyiv. Eventually, Kyiv lost it’s power and influence over the region and principalities began to separate. In 1169AD, Prince Andrey Bogolyubski marched upon Kyiv conquering and destroying the political system. Bogolyubski established his capital in Vladimir near present site of Moscow, thus originating present Russian state. The Ukrainian princes had defeated themselves by division. It was at this time that we begin to see a split between East and West Ukraine. The Western partion – Halych (Galicia) and Volynj (Volhynia)— were free from Polovetsian raids and gradually emerged as leading principalities. Prince Roman ruled there in 1199 and his sons succeeded in uniting both principalities into one rich and powerful state. It was in 1220AD that the Golden Horde of Tatars (Mongol) invaded Ukraine. The princes joined with their former enemy the Polovtsi and fought together to expel this new horde from the East. They succeeded briefly at first. However, by 1240AD, the Tatars returned and besieged Kyiv whose remnants still live in rural Crimea today. On December 16th, 1240, the Tatars conquered Kyiv and sacked the city destroying its fortifications to prevent its rise from the ashes. 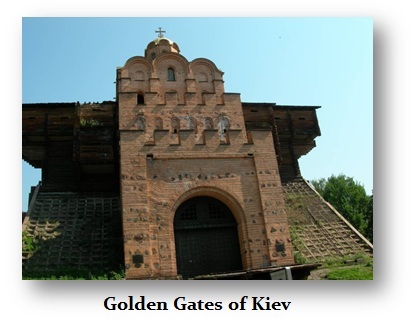 All that remains is the last of the Golden Gates of Kyiv, which were constructed between 1017-1024. This was the grandson of Genghis Khan (1162-1227) that destroyed the capital Kiev in 1240AD. Genghis Khan had tried to conquer China, but broke off his invasion in 1218 and turned toward the West. He died in 1227AD, and it was his grandson Kubla Khan (1215–1294) who turned back to conquer China in 1279. His dynasty fell in 1368, and so was the fate of the Mongolian Empire. After the fall of Kyiv, the hordes moved westward, plundering Halych, Poland and Hungary then in 1245 they returned and occupied eastern Ukraine where they are still found today. 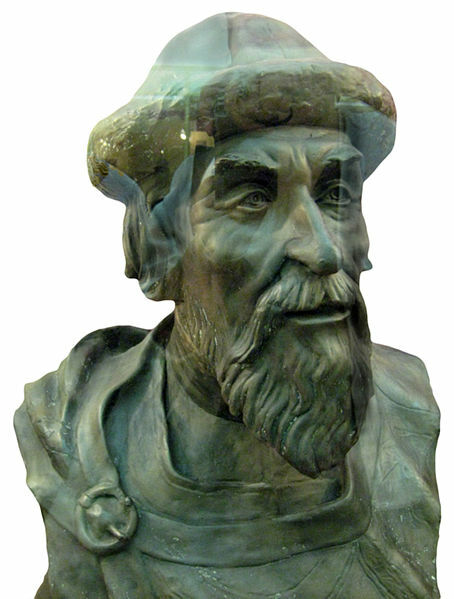 Prince Danylo (son of Prince Roman) fought in the Western part of Ukraine against the Tatars establishing the city of Lviv in 1250 as a defense site against Tatars. In 1253 he accepted the royal crown from the pope establishing a brief alliance with Rome. After Danylo died in 1264, his sons continued to rule in peaceful coexistence with the Tatars. In 1303 they rejoined the Byzantine empire with respect to religion breaking off with Rome. In 1299, with Kyiv destroyed, the Kyivan archbishopric seat was moved to Moscow making that the head of the region. After the death of Danylo’s son Lev, the Western principalities were headed with the capital at Lviv. After 1320, there were no male heirs to take the throne. This resulted in an unstable political situation where internal power fragmented as neighboring countries sought to grab influence, namely Poland, Hungary and Lithuania. They all sought to now occupy this part of Ukraine. In 1349, the Polish king Kazimyezh managed to occupy Halych and part of Volynj. About same time, Lithuanian princes tookover the eastern principalities of Ukraine. Finally about year 1360, the Prince of Kyiv was overthrown. Ukraine was then partitioned between Poland and Lithuania with Tatar Golden Horde remaining in some parts of southern steppes and the Crimea. The Lithuanian princes were actually enlightened rulers and they gained the support of the local people even adopting the local customs, language and religion. They also protected the people from Poland, Moscow and the Tatars. Poland was notorious and exploited their parts of Ukraine. The colonized the region as their people took lands without compensation. During the period of 1393-1430 Lithuania defeated the German hordes at the Battle of Grunwald that ended almost 200 years of war. Ukraine actually brought Christianity to the pagan Lithuania. Lithuania then emerged as one of the most powerful states in Europe. In 1400 Lithuania, together with its Ukrainian principalities, separated to maintain their character. Then in 1413, religion between East and West began to emerge and a decision was made to allow only Catholics to occupy important government positions known as the “Horodlo Privilege”. Virtually all Ukrainians in those days were Eastern Orthodox and would not qualify as Catholics. This was really a power-play. The Ottoman Empire began in 1326AD and was on a course of conquest that resulted in the fall of Constantinople in 1453AD under the reign of Sultan Muhammad II (1432-1481). While the fall of Constantinople led to the spread of knowledge by the flight of scholars to Rome beginning the Renaissance in Western Europe, this same flight altered the course of Russia. The niece of the last Byzantine Emperor Constantine XI (b 1404; 1449 – died on the Walls May 29th, 1453), (b 1440/9, or 1455-1503), fled to Russia and married Ivan III (The Great) (1440-1505). Sophia brought her court with her, but the critical contribution that she put Russia on the course to world recognition, was new acquisition of knowledge and culture. 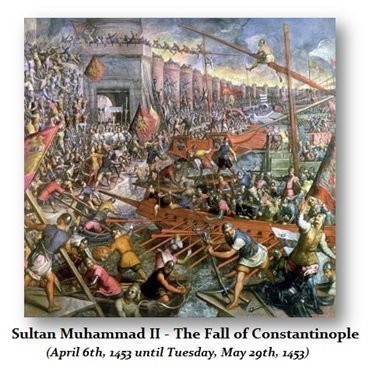 Therefore, the Fall of Constantinople had the profound effect of then spreading its culture and knowledge throughout Western Europe and even Ukraine and Russia. Ivan III (1440-1505) The Great ruled Moscow (1462-1505). Moscow became the seat of Greek Orthodox Christianity where much of it fled from the Turks. Schools of learning began to appear in Rome reviving old knowledge long since forgotten. Thus, the Fall of Constantinople in 1453 led to expanding the Age of Enlightenment broadening the arts and science that gave birth to so much in so many areas. It was no coincidence that Christopher Columbus discovered America in 1492AD for he used maps and ideas that were ancient in origin that came from Constantinople. There was a period of hostilities between Lithuania and Moscow, when about 1480 Moscow annexed several principalities in eastern Ukraine as it began to invade the area. We also see rising civil unrest after the fall of Constantinople against Poland and Lithusania who were major powers at this time. In 1490, there was an attempted rebellion under Mukha in western Ukraine who sought the help from neighboring Moldova. In 1500 we see in eastern Ukraine another attempted uprising under Prince Mykhaylo Hlynskiy, who solicited help from Moscow and the Tatars. Simultaneously, in the South Crimea region there were marauding Tatar hordes that seized a large area of the country where it was pure anarchy. This was the very rich part of Ukraine that had historically been a major wheat producer since ancient times. Here was the most productive soil, wild animals were still abundant, and the rivers were teaming with fish. This became occupied by the Tatars who remain there to this day. The Ukrainians that organized against the Tatars developed a new society of Cossacks in the South. In 1552, a Ukrainian princes, Dmytro Wyshnevetskyi, rose from this Cossacks society. He constructed a castle on the island Khortytsya. From there, the Cossacks conducted raids on Crimean towns sometimes with help from Moscow. Dmytro sought to develop Zaporizhia, with help from Lithuania and Moscow, where he desired to establish a powerful fortress against Tatars and Turks. His dream never materialized. In 1569, the Union of Lublin created a dynastic link between Poland and Lithuania that established a constitutional union of the two States as the Polish-Lithuanian Commonwealth. Ukraine simply became part of Poland at this time and we see an influx of more people from Poland moving into Ukraine establishing Polish rule of law. Ukrainian princes were mostly replaced by Polish. Peasants lost their land ownership and civil rights to the Polish and we see the European serfdom transforming Ukraine. The Greek Eastern Orthodox Church tended to distinguish Ukrainian literature reducing the people to a lower class within society. Western Catholics dominated commerce and the economic-political advancement while Ukrainians became a second class citizen suitable for serfdom. Ukrainian culture managed to survive. Eastern Orthodox Church schools and seminaries began to reappear based at first on the properties of wealthy Ukrainian Hryhoriy Khodkovych. Even a printing industry began to appear with the publication of the Bible in Ukrainian in a small print shop ran by Ivan Fedorovych. Trade started to reappear during the late 16th century with guilds for teaching skills. Schools emerged as well as hospitals and all were centers of the Orthodox Church. The influx of people to Cossack territory managed to increase their number and power pushing the Tatars further South into Crimea where they remain today. Ukrainian Cossacks now defended Ukraine and were actually emerging as the defender also of the entire eastern Europe from the Turks and Tatar hordes. The Cossacks were causing diplomatic problems for Poland since the Turks in the Ottoman Empire used the Cossacks as an excuse for wars against Poland. When Cossack leader, Ivan Pidkova, conquered Moldova in 1577, Poland captured and executed him in order to appease the Turks. Poland’s power was clearly declining. They tried to control the Cossacks by recruiting some of them into the Polish military system. However, this never really worked very well. Poland began to grant to Polish nobles and Ukrainian princes loyal to the king, territory that was controlled by the Cossacks. There was rising discontent regarding the treatment by Cossacks and this led to a rebellion about 1590. About 12,000 Cossacks were recruited as mercenaries by the Pope and the German Kaiser for war against the Turks. They managed to conquer Moldova and in 1595 and the returned to Ukraine to fight against Polish rulers and to defend the Orthodox population from the Jesuits from Rome. In 1596 at a synod of Brest, the Kyivian metropolitan and the majority of bishops signed an act of union with Rome. The church that emerged now recognized supremacy of the pope but retained the Eastern rites and the Slavonic liturgical language. Also in year 1596, Poland sought an all out war to conquer the Cossack forces. After several months of a siege, about 6000 Cossack fighters, in order to save their families, agreed to Polish terms to let them go free in exchange for handing over their leaders. However, after surrender, the Poles did not keep their word and they massacred the now unarmed defenseless Cossacks. A small section did not trust the Poles and they broke through coming to the rescue of the besieged Cossacks. The Polish abandoned the idea to conquer the Cossacks and returned to Poland, where they tortured and executed the captured Cossack leaders. The torture was slow lasting for about a year prior to a brutal execution. Poland did leave the Cossacks in a weakened state. Eventually, victories against the Turks and against Moldova restored the pride and unity of the Cossacks. In 1599, the Poland needed the help of the Cossacks against Moldova. Later Poland would seek their help in a war against Sweden. After the war with Sweden ended in 1603, the Cossacks demanded and obtained equal status with the Polish military units and secured authority over large area of Ukraine. Cossack power was now on the rise and they began raids on lands controlled by Moscow. The Cossacks destroyed or captured many Turkish galleons and plundered Turkish cities during times when the whole of Europe was trembling at the though of the Turks and the Ottoman Empire. The Cossacks never really exceeded perhaps 40,000 in number. In the spring of 1618, about 20,000 Cossacks marched on Moscow, conquering many towns and fortresses along the way. Near Moscow, they joined up with Polish forces under prince Wladyslaw, who sought the Moscow throne. They failed to capture Moscow, but extracted peace terms favorable to Poland. In 1620, Poland came to war with Turks where they were defeated in Moldova. Poland once again turned to the Cossacks for assistance. In 1621 a big battle against the Turks took place near Khotyn with about 40,000 Cossacks and 35,000 Polish soldiers. The Turkish army was forced to retreat. The Cossacks received full credit for this victory but very little in way of compensation cheated by the Poles once again. The Cossacks continued to defend Orthodox faith and protected Ukraine against the Polish exploitation of Ukrainian land and peasants. They were the most formidable force against the Turks who could never overcome them. In 1624, the Cossacks secured an unexpected alliance with the Crimean Tatars, who rebelled against the Turkish sultan. While the Turks sailed against the Tatar rebels, the Cossacks twice raided Istanbul and plundered both shores of Bosphorus. They then returned and helped the Tatars to expel the Turks from Crimea, thus securing friendly neighbors in their struggle against Turks and Poles. The history of Ukraine is a vibrant one, filled with a spirit for independence and freedom.